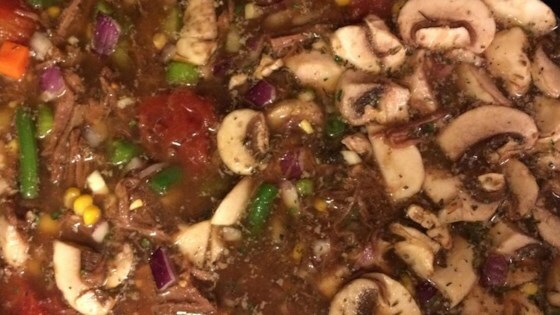 "Get ready for the many compliments you'll receive serving this fabulous, stick-to-your-ribs soup. I gave an old favorite a spicy twist by adding cayenne pepper. You will love it on a cold winter evening!" Trim fat from roast and cut into 1 inch cubes. Place meat in a large pot over medium heat with oil, onion and garlic and cook, stirring, until meat is browned and onion is tender. Pour in broth, tomatoes and water. Stir in mixed vegetables, mushrooms and celery. Season with oregano, thyme, basil, parsley and cayenne. Bring to a boil, then reduce heat, cover and simmer 75 minutes. Stir in pasta and cook 10 minutes more, until pasta is tender. Omit the pasta, it soaks up too much of the liquid, and there's not much of that. I'd make it again but double the spices, including garlic, and add another can of beef stock for more liquid. Excellent. I left out the cayenne pepper, mushrooms and pasta. I used fresh carrots and potatoes chopped and canned beans, peas, and corn. Very tasty. Will definitely make again.